Perugini made his international debut against Ireland in Italy's opening game of the 2000 Six Nations. Perugini made his name in Italy with Calvisano before representing his country at U21 and A level. He signed for French giants Toulouse before securing a place in the 2006 Six Nations' "Team of the Tournament". 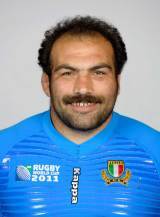 Perugini represented Italy at the 2007 World Cup, playing games against New Zealand, Portugal and Scotland before playing a full part in Italy's 2008 Six Nations campaign, winning his 50th cap against Wales at the Millennium Stadium. Perugini also enjoys lining up for the Barbarians. His most recent move took him back to Italy with Aironi in 2010 ahead of their debut season in the Magners League. Perugini will remain there for the 2011-12 season and will go to the World Cup with Italy having been named in their 30-man squad.